Researchers from the University of Hawai'i at Mānoa Department of Botany have discovered hundreds of potentially new species of fungi in the deep coral ecosystem in the 'Au'au channel off Maui. Mesophotic coral ecosystems (MCE) are generally found at depths between 130 to 500 feet and possess abundant plant (algal) life as well as new fish species. The mysteries of these reefs are only recently being revealed through technological advances in closed circuit rebreather diving. Previously overlooked—being too precarious for conventional SCUBA and too shallow to justify the cost of frequent submersible dives—mesophotic reefs continuously disclose breathtaking levels of biodiversity with each dive, yielding species and behavioral interactions new to science. 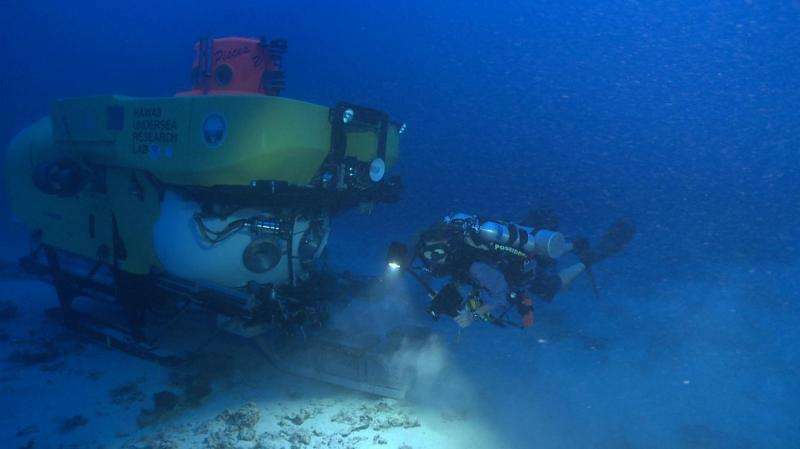 The UH Hawai'i Undersea Research Laboratory (HURL) used the Pisces V submersible to collect native algae from the mesophotic reefs in the 'Au'au channel. Using the DNA sequencing facility at the UH Hawai'i Institute of Marine Biology, Benjamin Wainwright, lead author of the study and a botany postdoctoral researcher, and colleagues determined which species of fungus were associated with the native algae. Fungi have been documented in almost all habitats on Earth, although marine fungi are less studied in comparison to their terrestrial counterparts. 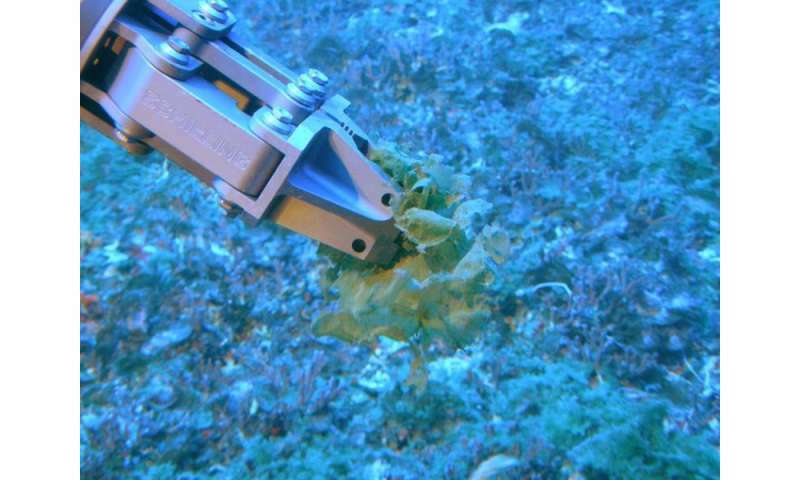 Scientists have found fungi in deep and shallow water corals, marine sponges and other invertebrates. The recently discovered fungi, however, were found living in association with algae. "To the best of our knowledge, this is the first documented evidence confirming fungi in MCEs," said Wainwright. Additionally, the research team discovered that 27% of the species detected in these deep dark environments are also found on terrestrial rainforest plants in Hawai'i. "Finding such high overlap of fungal diversity on terrestrial plants was surprising. Mesophotic reefs are as dark as it gets where photosynthesis is still possible, so to find the same species of fungi on forest plants illustrates the remarkable ability of some fungi to tolerate, and thrive, in extremely different habitats," said Anthony Amend, senior author of the study and UH Mānoa associate professor of botany. "This ecological breadth is something that seemingly sets fungi apart from other organisms." Plant-associated fungi provide many benefits to society. For example, Taxol, a chemotherapy medication used to treat cancers, is produced by a fungus found inside tree bark and leaves. Additionally, research has shown that fungi are useful in bioremediation efforts (for example, oil spill and industrial waste treatment) and capable of breaking down plastic waste. It is currently not known whether the newly discovered fungal species are pathogens, helpful symbionts or unimportant to their algae hosts. "Further, we don't currently know what metabolic capabilities they have that may prove to have medical or environmental applications," said Wainwright. "We know other undiscovered species are present in these ecosystems. Unfortunately, if we do not look now we may miss our opportunity to benefit from them and conserve them." Deep reefs, like those in the 'Au'au channel, may act as a refuge as Earth's climate changes, providing habitat for any marine creatures that can take advantage of this deeper habitat. If this is indeed the case, understanding how this habitat functions and how the corals, algae and fungi interact with one another will be vital to preserving the refuge in the deep.